Serendipity is a luxurious waterfront Guest House and Fine Dining Restaurant, situated in Wilderness in the Western Cape province of South Africa. 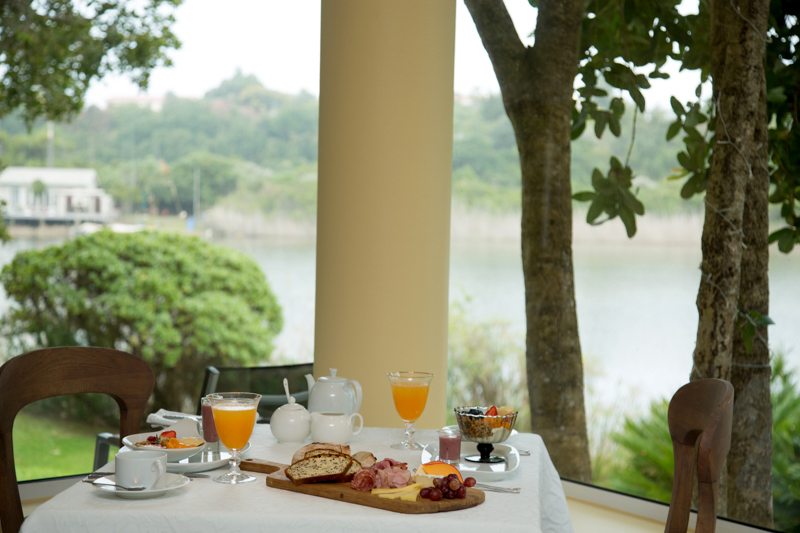 Cradled by the protected indigenous evergreen Outeniqua forests of Garden Route National Park and the Touw River estuary, Serendipity is a perfect hide-away from where to explore the Western Cape Garden Route. Its pristine beaches, the Outeniqua and Swartberg mountains and historic mountain passes, rivers and kloofs and shaped over million of years. Its indigenous forests and fynbos, and mountain are a true “Eden”. Experience the many leisure activities: from golfing at internationally acclaimed golf courses, whale and dolphin watching, sharkcage diving, hang gliding, mountain biking, horse riding to bungee jumping and more! Serendipity Restaurant is a South African global winner of the 2018 World Luxury Restaurant Awards for South African cuisine and fine dining. It is also the top-rated Trip Advisor restaurant in Wilderness. It also featured under the Ten Best Restaurants in the Western Cape Province. It showcases the indigenous bounty from sustainable sources, organic where possible, always fresh, lovingly sourced and prepared by professionally trained and enthusiastic chefs. Pre-dinner aperitifs are offered on the water- edge patio. 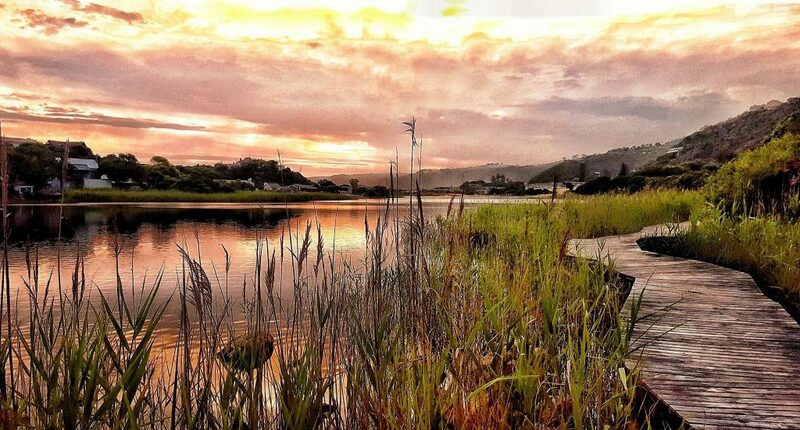 Guests enjoy views of the Garden Route sunsets and the water-birds. Chef Lizelle or maître d’ Rudolf talk guests through the menu. Experience fine dining in an unforgettable setting! Remember we are serving South African fine dining, table d’hôte, five course dinner, from 6.30pm, Mondays to Saturdays. We don’t turn tables so that you can enjoy your celebrations. Come and enjoy authentic, unique, and personalised experiences at Serendipity! The general location and site specifics of Serendipity was carefully and meticulously selected to satisfy the owners’ ecological and environmental dreams. Serendipity is within the confines of the Garden Route National Park. The Outeniqua Mountain has spectacular poorts and passes. Cape Fynbos, the Afromontane Forests and Southern Cape Wetlands with its UNESCO proclaimed water bird sanctuary, will offer unforgettable views and life-long memories. 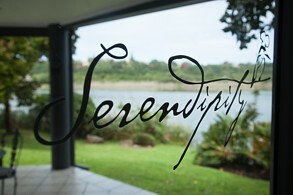 Serendipity Fine Dining Restaurant is situated on the banks of the Wilderness Lagoon in the Western Cape Garden Route. You are invited to come and to enjoy an unforgettable, uniquely South African inspired, gourmet experience. Restaurant is open for dinner Monday to Saturday. Closed on Sundays, Good Friday, Xmas and New Year’s day. Wine is selected from the best vineyards in South Africa with a focused attention on wines that will complement the menu and that will ensure a memorable dining experience. The wine list contains a spread of varietals and a description of each wine that is helpful for novice wine drinkers and our overseas guests unfamiliar with local labels. To assist you, Rudolf and Lizelle gave the wine a 5-star rating (our opinion on each wine). We also pride ourselves on giving good personal advice, not only on wines that will complement our food but also wine that your personal palate would enjoy. The word serendipity was coined by Horace Walpole, 28th January 1754, in a letter he wrote to his friend, Horace Mann, the English resident in Florence. He told him that he invented it in reference to the title of an old Persian fairy story The Three Princes of Serendip, whose heroes regularly discovered pleasant things that they weren’t searching for. But if you read the story you will find that the princes were actually well educated and intelligent men. Their good fortune was based on careful deduction, not chance. As the saying has it, “fortune favors the prepared mind”, just as discoveries today that are said to be serendipitous are so often the result of experience and good observation. Serendipity was conceived in 1999. Its owners are passionate for the environment, people and romance. “We realized right from the start that attention to detail is what makes any experience special. And we believe that a combination of personal attention, comfort and positive experiences are important to our guest and can be achieved through careful planning”. Celebrate your special events or celebrations at Serendipity. We cater for birthday parties, engagement celebrations, wedding anniversaries, dinner parties, corporate functions, retirees and executive retreats and more. Let us plan that special celebration for you for an unrivalled and unforgettable experience.